Odessa Opera and Ballet House is among Ukraine’s greatest architectural monuments and is one of the most beautiful theaters in the world. 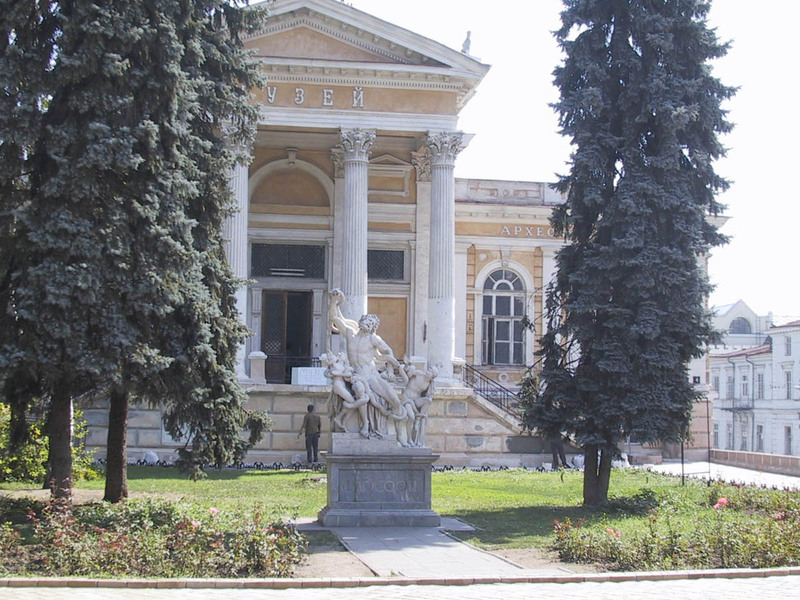 The theatre has an Italian baroque facade, with a Renaissance–style entrance and stone figures depicting scenes from Aristophanes and Euripides. There are also allegorical stone sculptures of the Goddess of Tragedy, in a chariot drawn by four panthers; Orpheus, charming the centaur with his music; cherubs playing, singing and dancing teaching a young girl; there are busts of Pushkin, Gogol, Griboyedov and Glinka, representing poetry, comedy, drama and music. The auditorium is in the style of Louis XVI, with a chandelier that weights almost two and a half tons, surrounded on the ceiling by frescoes depicting scenes from Twelfth Night, A Midsummer Night’s Dream, A Winter’s Tale and As You Like It. 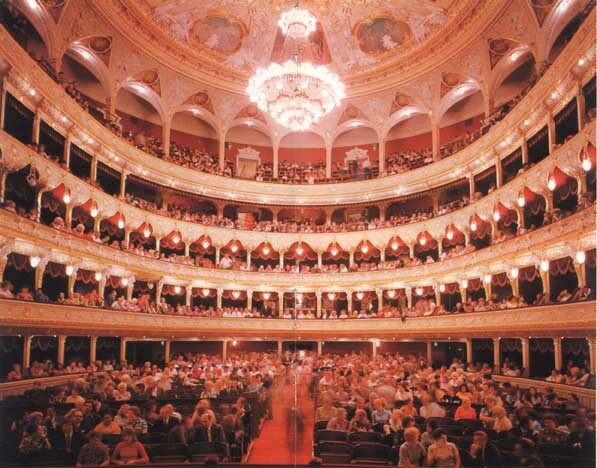 The architects, remembering a fire in a Viennese theater, provided the foyer with twenty four exits. We strongly recommend every visitor take a tour or visit a show at this magnificent structure. After the opera house, take a stroll towards Potemkin Steps, but prior to taking a walk down towards the port note the central statue of Duke Richelieu, the first governor of Odessa. Visiting Russia in 1795, Richelieu was appointed lieutenant colonel of the Cuirassiers of St. George, and later Tsar Alexander I appointed him governor of Odessa and governor general of New Russia, the area between the Dniester River and the Caucasus. 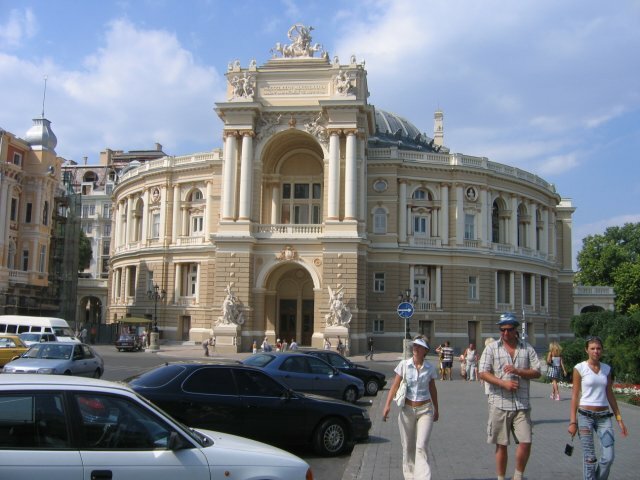 After cleaning up a corrupt administration, Richelieu transformed the Black Sea village of Odessa into a modern city. He constructed port facilities and encouraged agriculture and commerce. After a Kodak moment with Duke, take a stroll towards Potemkin Steps; the legendary staircase which saw a 1905 battle between mutinying sailors and forces loyal to the Czar. The clash was immortalized in Eisenstein’s 1925 silent film, “Battleship Potemkin.” Some obscure facts about the steps as a structure is the fact that you can't see the steps at all when standing atop - all you can see are a few landings. However, when you stand below the steps, all you can see are the steps. It is an optical illusion. The steps took four years to build and were completed in 1841. Take a stroll down the steps and venture across the street to the long pier to catch a boat cruise, or hike back up for the best workout around. After an intense work out consisting of climbing Potemkin Steps, relax by taking a leisurely stroll through the shady Primorskiy Boulevard. This boulevard is located directly atop of Potemkin Steps. It has often been used as a backdrop for numerous Soviet made movies. 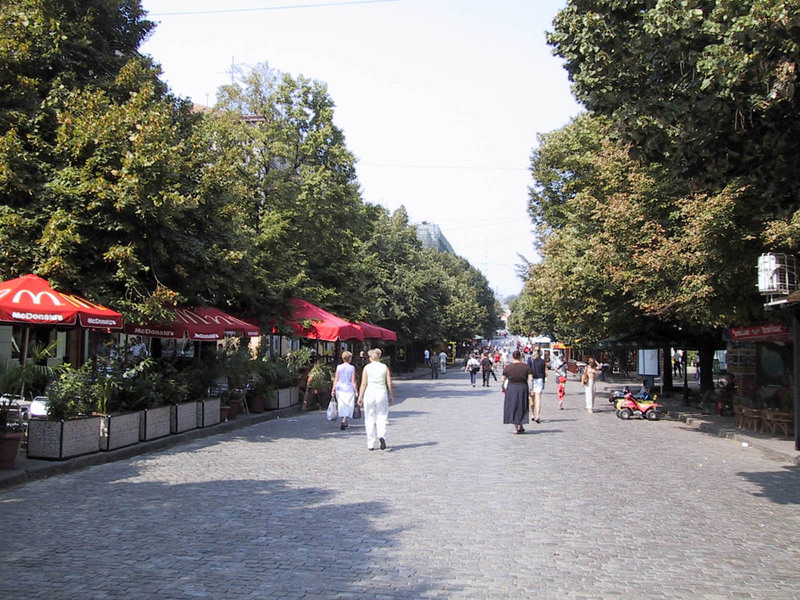 And why not, since its wide cobblestone streets and tall trees provide a scenery that rivals Paris. 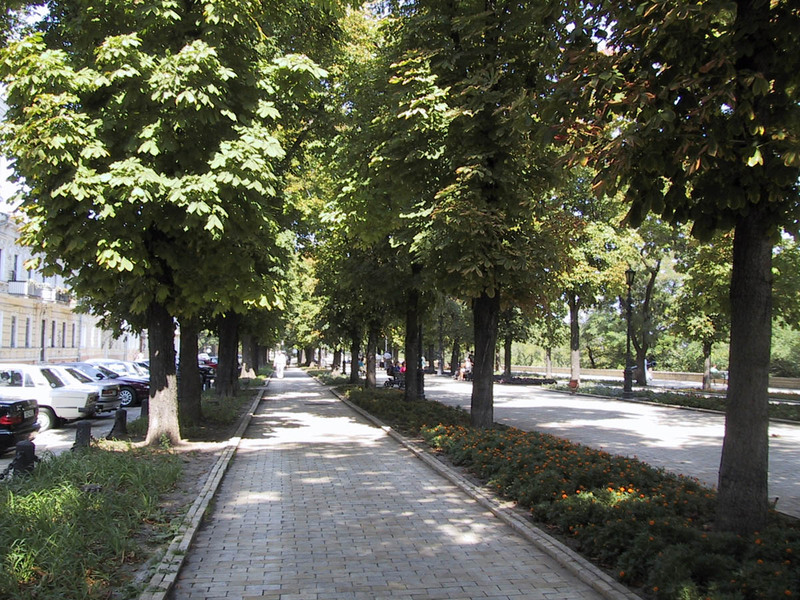 This boulevard is one of the most picturesque areas in Odessa. Strolling south on Primorskiy boulevard (about 200 meters) will bring you to a historic building which is currently Odessa’s City Hall. 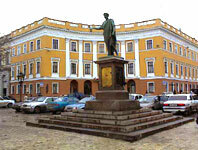 It is located in front of a monument to Alexander Pushkin, which is considered by many to be Russia’s greatest poet. Pushkin spent 13 months in Odessa, naturally falling in love with the city’s charm. 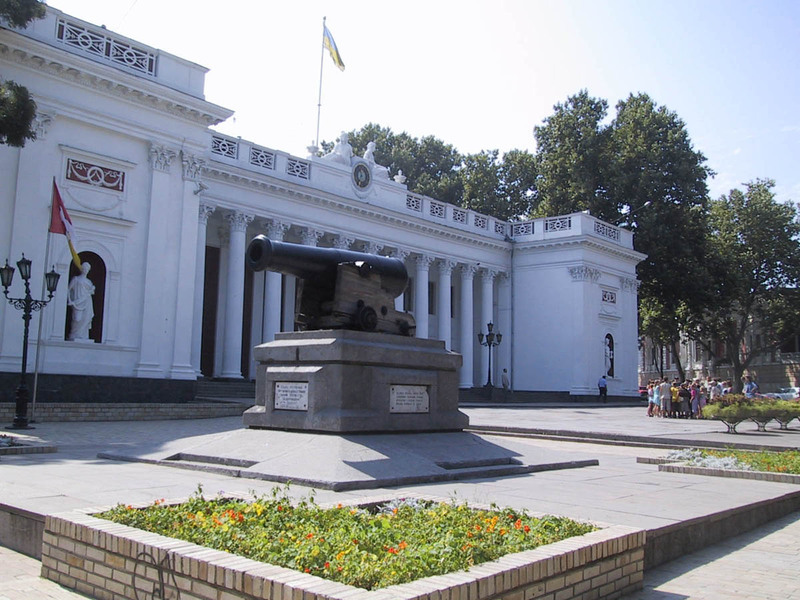 After City Hall, take a right and notice a Statue of Laocoon , which marks the entrance to Odessa’s Archaeological Museum. 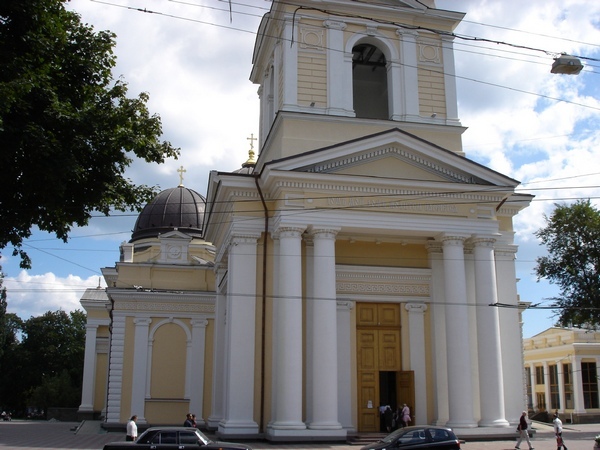 One of the oldest in Ukraine, it was founded in 1825. Its development was promoted by the Odessa Society of antiquity and history, which had the right to carry out excavations in the Northern Black Sea Region. There are more than 160,000 exhibits. They are the basis of one of the largest collection of information sources about ancient history of Northern Black Sea region. The museum possesses rich collection of archaeological relics of primitive and classical culture, relics of ancient Egypt, Ancient Greece and Rome, besides there is a large and valuable collection of coins and medals. After examining all of 160,000 exhibits at Archeological Museum, we walk outside to find ourselves on the famed Deribasovskaya Street. This famous street has been featured in thousands of books, films and songs, and remains one of the most celebrated in Ukraine. Odessites are passionate about Deribasovskaya, and a trip downtown cannot be complete without at least an hour spent strolling here or people watching from one of its many cozy outdoor and indoor cafes. 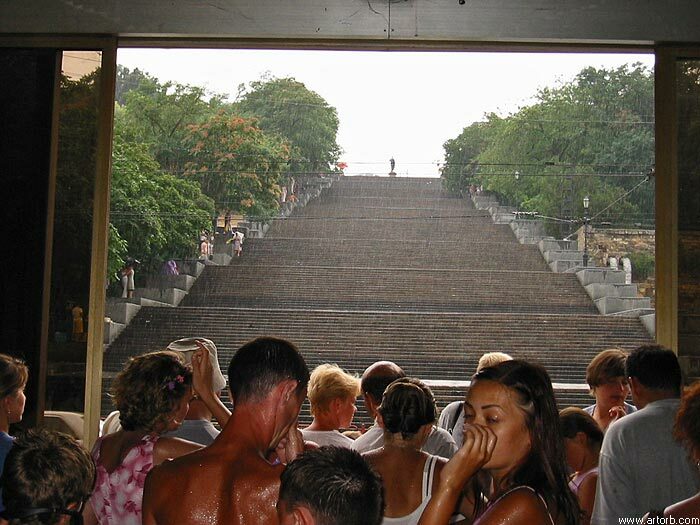 Each year Deribasovksaya gets more beautiful and of course, more crowded with tourists. After about a 10 minute walk on Deribasovskay Street you will see Sobornaya square that houses an impressive looking Spaso – Preobrazhenskiy Cathedral . Sobornaya square is a pleasant location to take in the scenery while sitting on a bench, people watch or do a little shopping in the Passage shopping mall,located directly across it. Greatm ixture of shops is located in an elegant building in this city center mall. Even if you have no desire to shop, it is worth seeing this work of art. Not a single city in Ukraine and in all likelihood in all of the former USSR can boast of such an abundance of monuments, memorial plaques, and other “street furniture” per capita as can Odessa. While the best way to see these is to aimlessly wonder around the city, a few are of greater fame and importance and thus are worth pointing out. First one is a monument of Leonid Utesov, a famous Odessa jazz singer and songwriter. 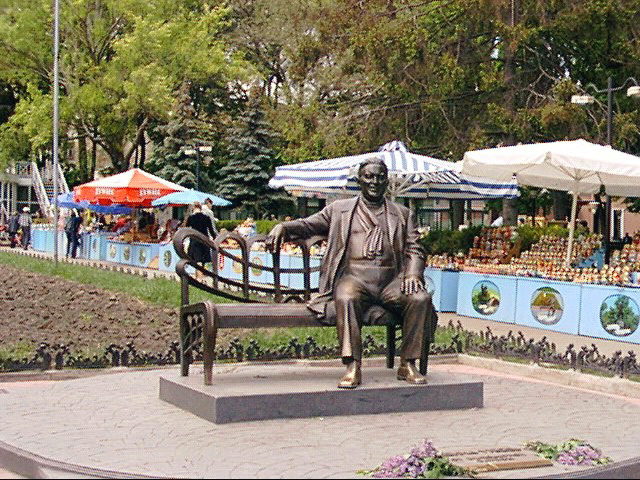 Eternally he sits on a bench located directly next to Gorsad ( City Garden) on Deribasovskaya Street. Another interesting exhibit is located directly behind the Port terminal, adjacent to the marina. Here, you won't be able to miss this charming sculpture of bronze to the rounded shapes under the name “The Golden Child” by sculptor Ernst Neizvestny. 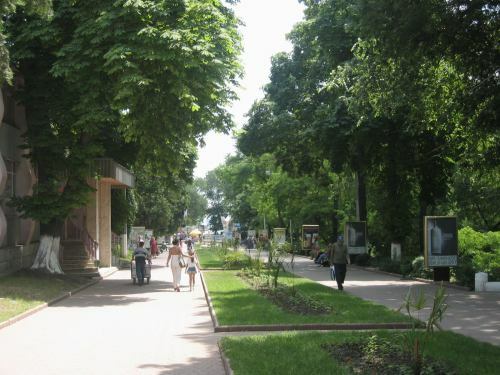 After you are finished with Deribasovkaya Street (which can take awhile) and monument hunting, you can either stroll or take a cab to Park Shevchenko. Walking would take approximately 15 minutes while a cab ride will get you there in less than 5 minutes. The park is home to World War II Memorial called the Alley of Glory, constructed in 1961. 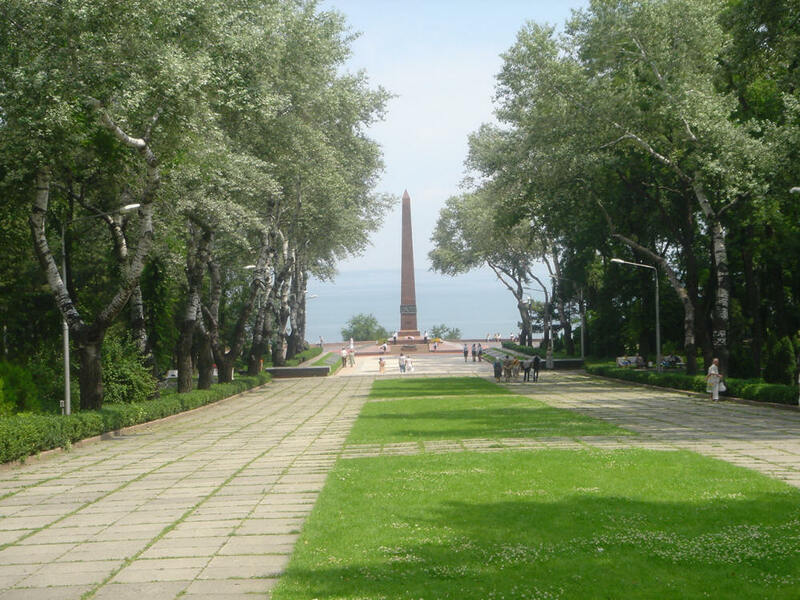 The park is large, with 225 acres on a plateau which overlooks the Black Sea. No daily trip around the city is complete without Arkadia. To get to Arkadia you will need to hail a cab and from the centre of the city it will take no more than 15 minutes. This is the jewel of Odessa's Nightlife and beach activities in the summer months. It is one nonstop party, with restaurants, bars, cafés, clubs and of course, a lovely stretch of sand and sea. Above the beach, the patios of dozens of themed restaurant, bars and clubs provide shady spots from which to people-watch and take in the scenery. Sample delicious local seafood or various ethnic cuisines while also enjoying ice-cold beer or cocktails. The best tables are often reserved, but good service and smiles are not uncommon here. After the sun has set the music takes over and the Arkadia strip comes alive with dancing and nightlife, becoming what some call the biggest party in Ukraine. 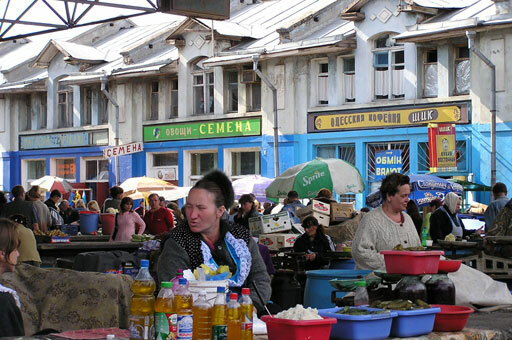 While not an attraction per se, adventurous types will enjoy a visit to Odessa's Privoz (Russian translation is 'Supply Place') which is an enormously sized outdoor / indoor market, which rivals those of Istanbul and Mexico City. During the days of Communism, Privoz was the only market that assured generous supply of every food type imaginable. Even though the Communist days are long over, Privoz remains a sight to see due to its massive size and array of products offered. It is fair to say, that anything can be found at Odessa's Privoz although to see it all may take hours. Privoz is located in Odessa's center, just a short walk away from the main train station.